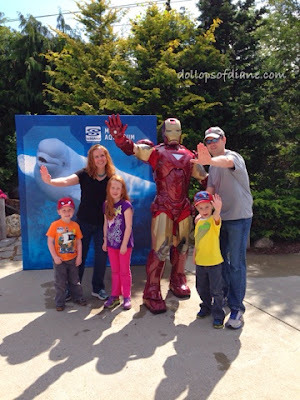 Last year, Henry and I had a special one on one trip to the Mystic Aquarium and this year we decided to take the rest of the family along. I've said it before and I'll say it again - I love the Mystic Aquarium and I was excited for the other kids to have their first experience there. We lucked out and happened to go on a day that Spider Man and Iron Man were also at the Aquarium. They have all kinds of fun events and guest appearances each week that you can check out on their events calendar HERE. Henry was so excited to have his picture taken with Iron Man. We let him get a picture by himself and then we all jumped in for a pic! After our superhero fun, we continued on with the outside exhibits. 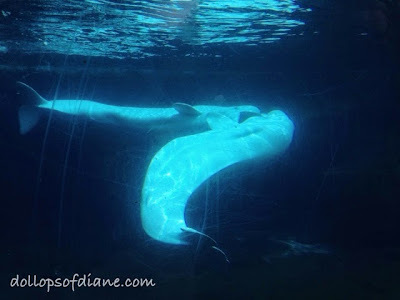 Like last year, the beluga whales stole my heart again. They are so fun and playful you can't help but love them. I'm also a sucker for the penguins. 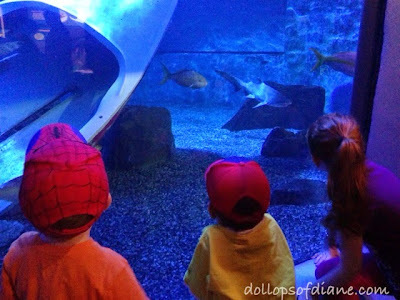 The kids loved watching them swim under the water through the little side tunnels. 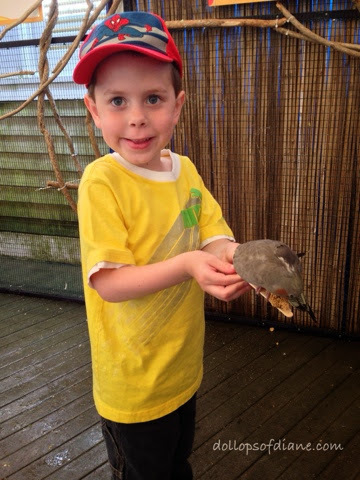 After spending a long time watching and counting frogs by the Marsh Trek, we headed to the new Birds of the Outback Exhibit. 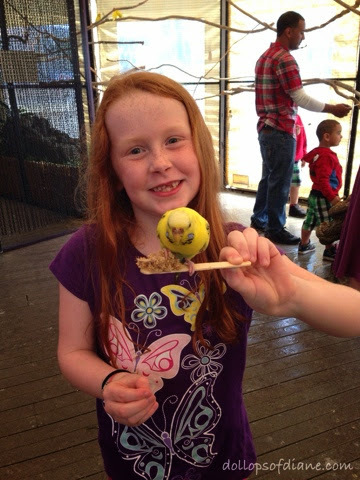 There is a $3 exhibit entry fee which gains you access to a 1,200 square foot aviary which houses hundreds of free flying birds. Now I was actually a little skeptical of the exhibit but I must admit that it was really cool. They give you a millet seed stick which allows you to feed the birds. Daniel spent most of his time aggressively chasing the birds with his stick but Isabelle and Henry were able to actually feed them. They both loved it! After we finished up the outside portion, we headed inside to the Main Gallery. They have so many cool animals including fish (obviously! ), sting rays, sharks, jelly fish, turtles, and more. The boys favorite part of the inside exhibit was the touch tanks. 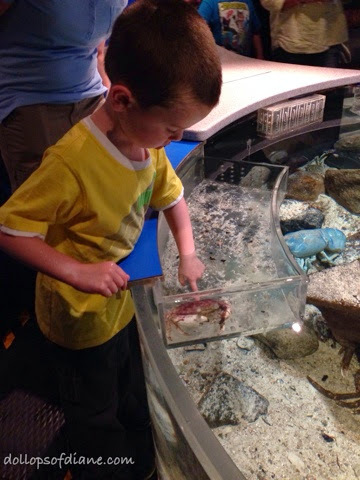 Daniel enjoys basically soaking his whole arm while not even touching an animal. Henry loves to hold and touch anything he can get his hands on! After the Main Exhibit Hall we headed to the 4D theater to check out Rio 4D. It's an interactive 4D experience where you follow along with the blue macaws as Blu learns to fly. It's only a 5 minute film which is nice since Daniel wouldn't sit still for much longer than that even with the excitement of the movie. There is an additional charge to attend the 4D movie unless you purchase the value ticket so you might want to consider the value ticket if you plan on seeing the show. Following the 4D experience, we headed to Titanic 12,5400 Feet Below. I enjoy this exhibit because it is educational for adults and older children but also has plenty of hands on exhibits to keep younger children occupied. So there you have it, another super awesome trip to the Mystic Aquarium in the books. 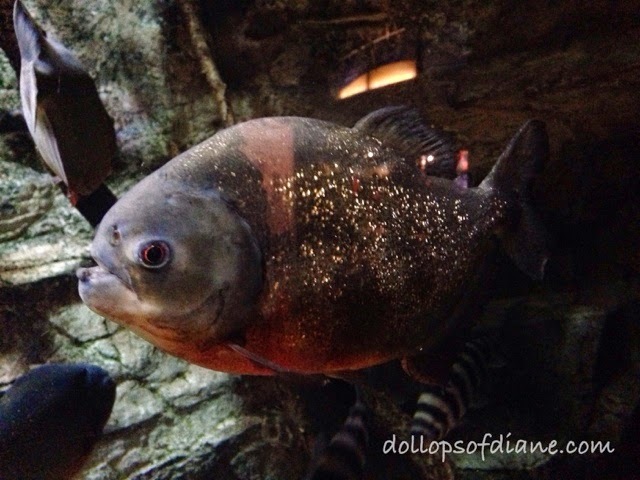 The Aquarium is definitely chock full of fun stuff to do so plan on spending a full day there. 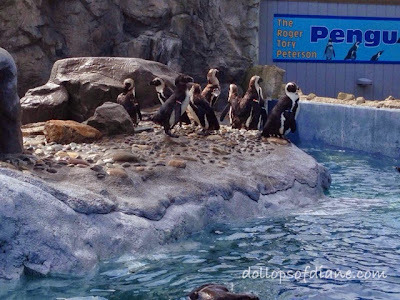 Now like most great places, the Aquarium can be pricey. I mean those belugas gotta eat, right?! You can check out their prices HERE. So definitely do your research and check your local library for discounted passes. Also, think of spending a weekend in Mystic since if you have your ticket validated before you leave, you can return for two consecutive days for free. I also always look into memberships when checking out aquariums or zoos since they often pay for themselves with just a couple of visits throughout the year. Be sure to follow Mystic Aquarium on Facebook (HERE!) to keep up to date on all the latest events and activities! Do you have a Martha Speaks fans in your house? If so, get excited because Martha is celebrating the start of summer with three all-new episodes starting June 16, 2014! Never seen Martha Speaks? Well you are missing out! Martha Speaks works to help increase children's vocabulary with a fun and familiar talking dog. 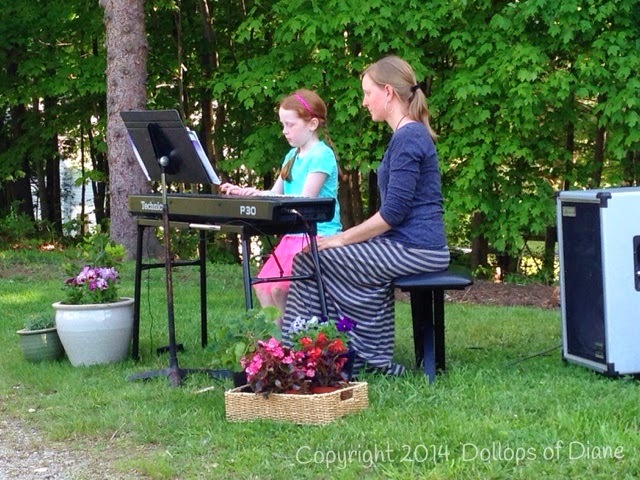 Want to hear your child using words like melody, digress, translate, punctuation, and inspiration? Well then Martha is your girl! "Though Callest Me a Dog" - A dog speaking Shakespeare? 'Tis a consummation devoutly to be wished and achieved when Martha swallows Hamlet. Never was a dog's desire for meat so artfully expressed. "Martha's Paper Chase" - It's the Town Crier deadline and Carolina needs a headline. Hot on the trail for a story, and a biscuit, Martha stumbles into a scoop that screams front page: the whereabouts of Big Minnie. But is exposing Minnie's privacy worth the story? The kids loved the episode! And if you want to see something funny you should listen to a three year old saying the word soliloquy! One of the reasons I like Martha Speaks is because they use some words that can easily be used in day to day conversation (like confirm and musician) and some more abstract words (like insignia and monologue). We are definitely looking forward to checking out the other two episodes next week! We've also been enjoying fun online with the Martha Speaks Website including the new game Martha's Steaks. In this game, kids learn vocab words by helping Martha's friends hurdle, dash, soar, and tumble to catch treats through Martha's dream landscape of steaks, bacon, and drumsticks. Mmmm...bacon! On the Martha Speaks website parents can also access fun and educational resources, lesson plans, and activities to help their children learn new vocabulary in fun and exciting ways. So check your local listings to find out what time PBS Kids will be airing Martha Speaks in your area starting June 16, 2014. I know we'll have our DVR set! You can also follow Martha Speaks on Facebook HERE and Twitter HERE! 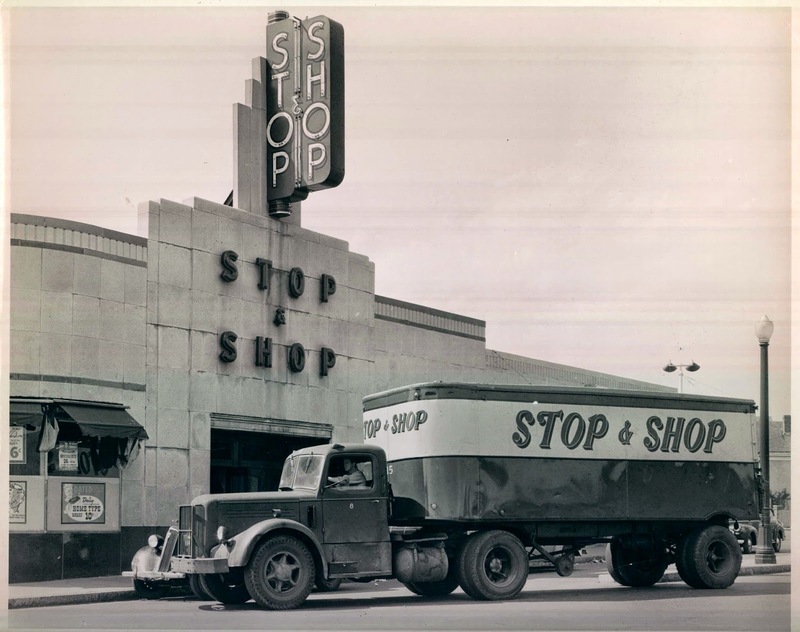 I've said before how Stop and Shop is our go to store for grocery shopping. You can find me in the Foxboro, MA location probably about 4 times a week. It's like my home away from home! That's one of the reasons that I'm excited to share the news about their 100th anniversary celebration. I'd like to think one of the reasons for their success is their friendly staff and reasonable prices. I bet my kids would think it's the complimentary deli cheese and bakery cookies. Either way 100 years is no joke! Stop and Shop kicked off their celebration on Memorial Day and will be continuing it through the actual anniversary date of September 6, 2014. Throughout the store you'll see retro packaging of items such as coffee, New England clam chowder, hot dog/hamburger rolls, and ice cream. You'll also find anniversary offers in their bakery, florist department, and deli. In addition to the in store promotions and deals for customers, Stop and Shop will also be donating $1,000 to 100 New England non-profit organizations over 100 days. These donations are in addition to the $15 million in donations to hunger relief organizations and children's health and wellness programs in MA, CT, and RI this year. Also, if you are local you can enjoy a summer concert series at their New England Headquarters. Every Wednesday from June 4th to September 3rd enjoy a free concert from noon to 1pm at 1385 Hancock Street in Quincy, MA. To follow along with the activities, events, and savings throughout the year, be sure to follow Stop and Shop on Facebook HERE and Twitter HERE. Want a little break on the grocery bill this week? One lucky Dollops reader will win a $25 gift card to Stop and Shop. Enter using the Rafflecopter form below! *I received a package of retro 100 year anniversary products as well as a Stop and Shop gift card. As always, all opinions are my own. Yesterday was Founder's Day which celebrates our town's birthday (or...something like that). We started off the day by watching the parade. It was beautiful weather and the kids loved dodging oncoming parade floats to grab stray pieces of candy that were thrown out to the crowd. That's what parades are all about, no? We then walked to the local athletic fields for a day full of games, ice cream, and sunshine. It's always such a great day full of friendly, familiar faces everywhere you turn. After the celebration, the kids played outside before we headed to a graduation party. The party consisted of more fun in the sun and treats. It was definitely a great day to be a kid. Towards the time we were getting ready to leave the party I told my husband that we should try to go to our town's fireworks. 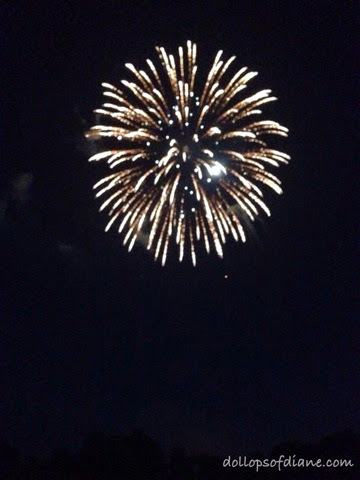 Now mind you, it was already our kids' bedtime (7:15pm), the fireworks weren't even set to start until 9pm, and the kids had been outside ALL day long (aka were going to crash hard soon). So like any sane person, my husband said it was not a good idea. I deep down knew that since I had been saying for weeks that there is no way we would take them. But there was just something about the day - Maybe the beautiful weather? Maybe the fact we were already out late? Maybe...just maybe... the cocktails I had enjoyed at the party? Something made it seem totally do-able. So we did it. We got home, ran inside (literally), put pajamas on the kids, and headed back to the fields. I think the kids were so excited that they were out so late in their pajamas that they never even thought to complain about the walk. We claimed a spot with our blankets and the kids played until the fireworks started. Then they started - it was the first time any of our kids had seen live fireworks - and it was magical. They all were in such awe. They thought it was absolutely amazing. Henry declared, " They should call them something else like 'awesome works!'" Sitting there on that blanket with my husband and seeing the amazement in the kids' eyes was magnificent. I'm so glad we went. I have no doubt that it will be one of those moments that will stick with me. Life is full of millions of moments and if we're lucky some of them are simply perfect. My family and I had the opportunity this week to attend the Grand Opening of the new Great Wolf Lodge located in Fitchburg, MA. The kids had no idea that we were going. We told them we were going to do "something fun" and they almost lost it when we pulled in and started unpacking the bags that I had secretly packed. It was such a fun surprise! We headed up to our room which had two beds and a pull out couch which was perfect for our family of five. We didn't last long in the room though before we headed directly to the indoor water parks. Now I'm not going to lie - the thought of bringing my three young kids who are all varying degrees of non swimmers to just learned to swim without a safety bubble was a bit terrifying. I was afraid that it might be too much for us - like my husband and I would need to be holding them in the water constantly or there wouldn't be enough "little kid" stuff for them. Well I am so happy to report that that was not the case. The water parks were perfect for us! They check the kids height before they enter the park and give them a colored bracelet that they wear for the duration of the trip that tells lifeguards/staff what the kids can and can't go on. They also have plenty of life jackets and encourage poor/non swimmers to wear them. 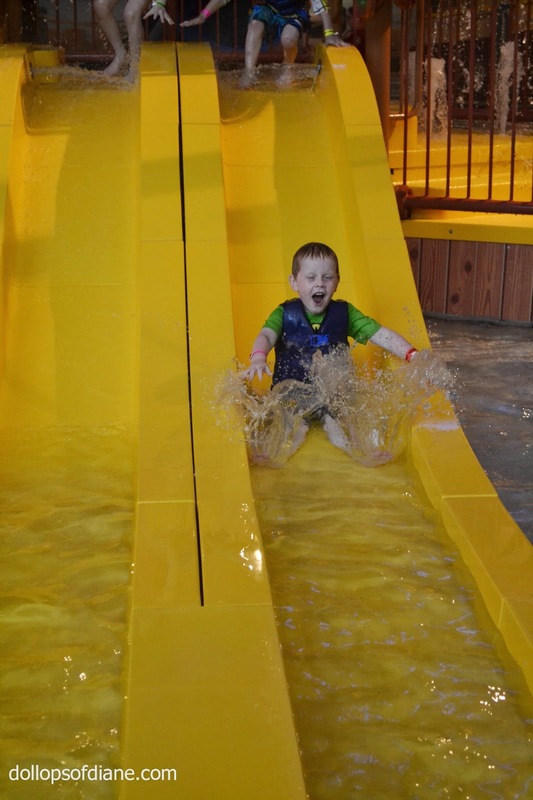 With the exception of the water slides, even the littlest kids can really go in/on anything as long as they have a parent with them. Most of the pools are low entry as well so the littles don't have to go too far in if they don't want to. The big kids loved going far in the wave pool and Daniel loved it by the "shore"
Henry was tall enough to go on all of the big slides except one. I took him on the River Canyon Run as his first ride and my Lord, the excitement and thrill on his face was totally priceless. He smiled, yelled, and giggled the whole way down. He LOVED the slides and spent most of day two going down them with my husband. Isabelle was tall enough to go on all the big water slides so she and I went on the Tornado. There was a drop in it (a six story drop followed by lots of swishing/swirling!) where she was visibly freaked out but the good thing about slides is that they are over fast. At the end though she said she liked it and we hiked back up the stairs to do it again! Another great thing about the water parks is that the life guards were so attentive. They were everywhere and constantly scanning the water. 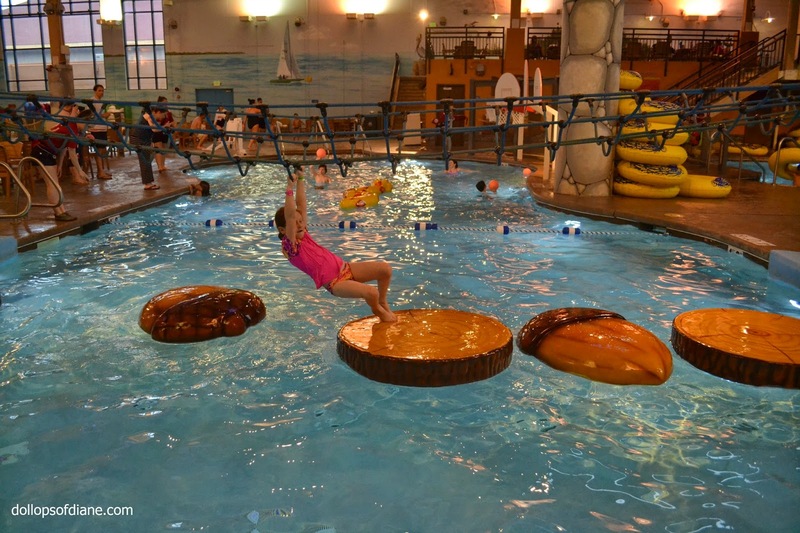 The kids had a BLAST - so, so, so much fun in the water! So we finished up day one by getting a pizza at Hungry as a Wolf and headed up to our room with it. We were going to try out the sit down restaurant but there was a wait and it was already way past bedtime. We knew the kids were going to be crashing soon so eating alone in our room was the better way to go! On day two, we first fueled up at their on site Dunkin Donuts(!!) 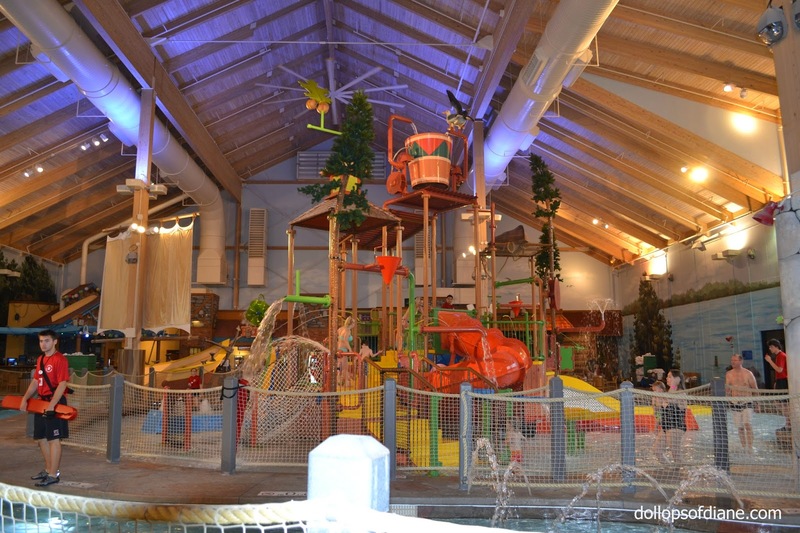 and then split the day between water park activities and checking out all the other fun stuff they have to do at the Lodge. 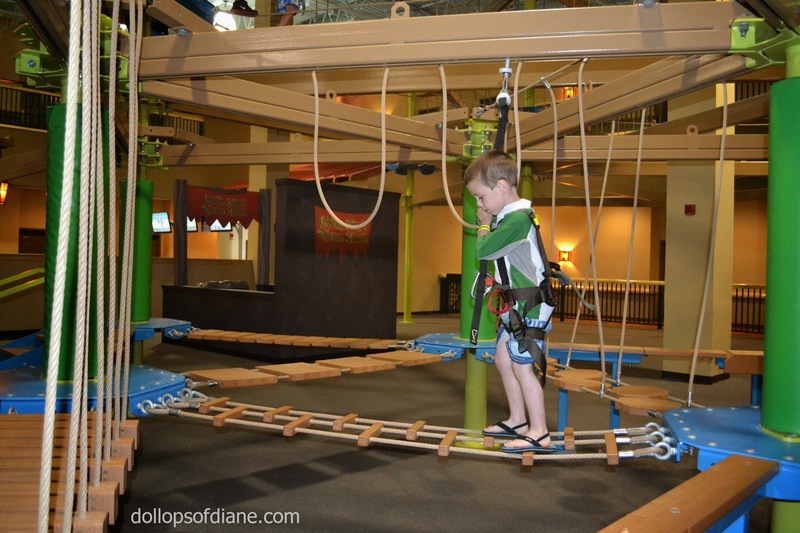 At the Howling Timbers Play Park they have video games, rides, indoor mini golf, bowling, and an adult and child ropes course. So fun, right? 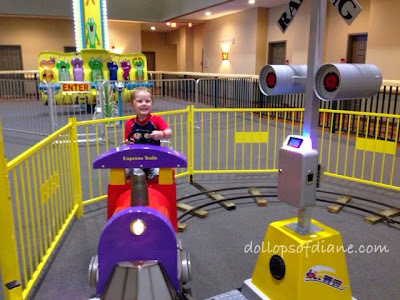 They also have an indoor arcade, the interactive MagiQuest game, Lazer Frenzy, Scoops Kids Spa, plus stores and more. 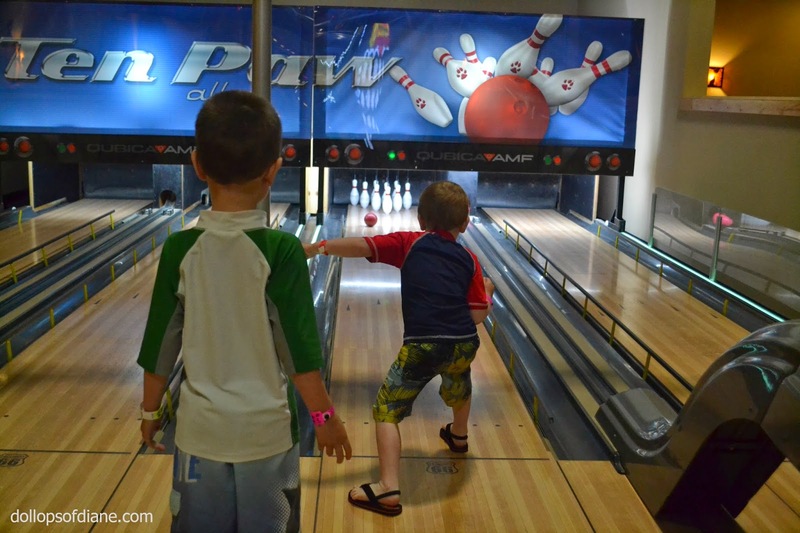 We spent most of our time at the water park, at the arcade, or at the Timbers lay Park. There was just so much to do everywhere! They also have discounts including the Paw Pass if you want to do a bunch of the activities at a discounted price. 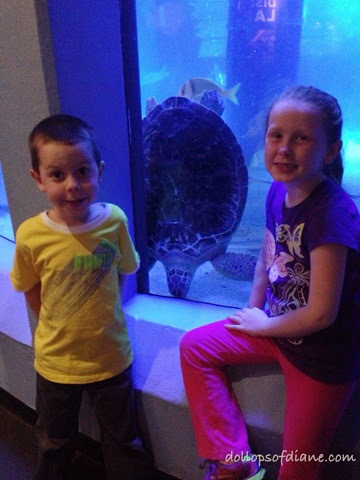 The kids changed their minds about a million times as to what their favorite thing about the trip was. I'm not surprised since everything was so awesome for them. 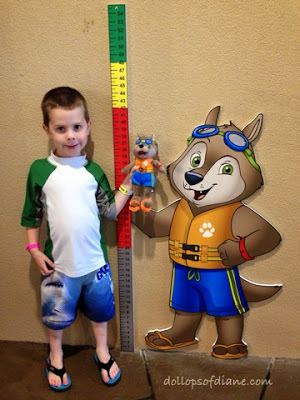 After we got home last night, Henry declared, "The Great Wolf Lodge is the best hotel ever." 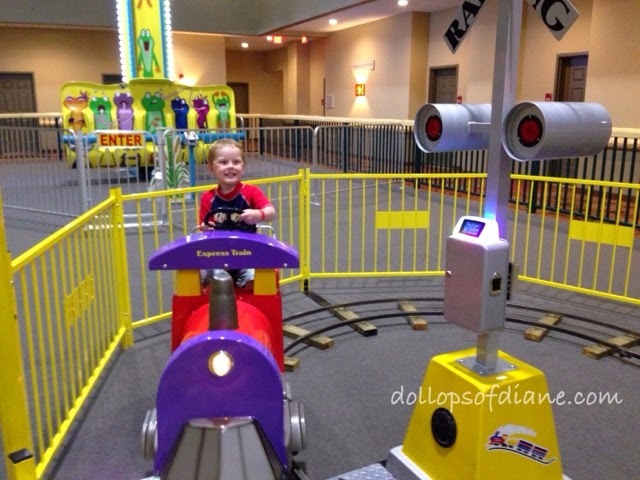 I think he might have hit the nail on the head - definitely a great spot for tons of family fun! 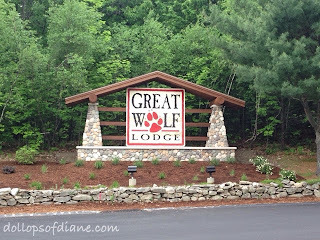 Check out Great Wolf Lodge New England's web site HERE to learn more. You can also follow them on Facebook and Twitter! 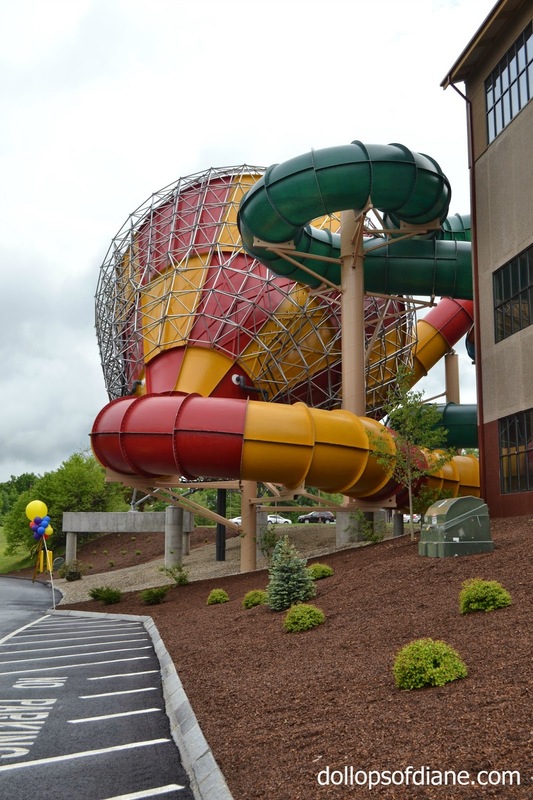 *My family received a complimentary stay with amenities for the Grand Opening. As always, all opinions are my own. 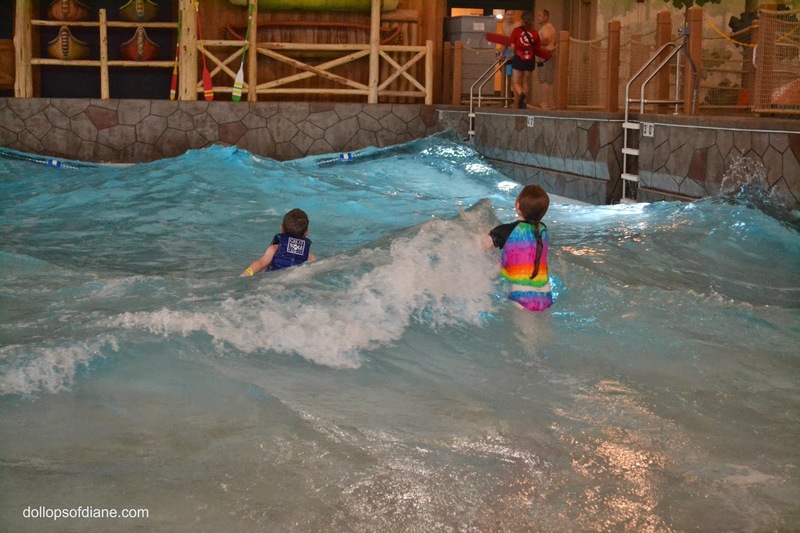 *UPDATE: Check out the fun we had when we visited Great Wolf Lodge a second time in September HERE!